One of the fundamental differences between a fluid clutch (a fluid coupling or torque converter) and a mechanical plate clutch is slippage. A healthy plate clutch slips only briefly when engaged or disengaged. Once the clutch plate is fully engaged against the pressure plate, both must turn together at the same speed. This is why a disc clutch must be disengaged or the transmission shifted to neutral whenever the vehicle stops. If the engine isn’t free to turn faster than the driveshaft at rest or extremely low speeds, the engine will stall! By contrast, a fluid clutch always slips at least a little. When the vehicle is at rest, the fluid clutch slips enough to allow the engine to idle with the transmission in gear without stalling. 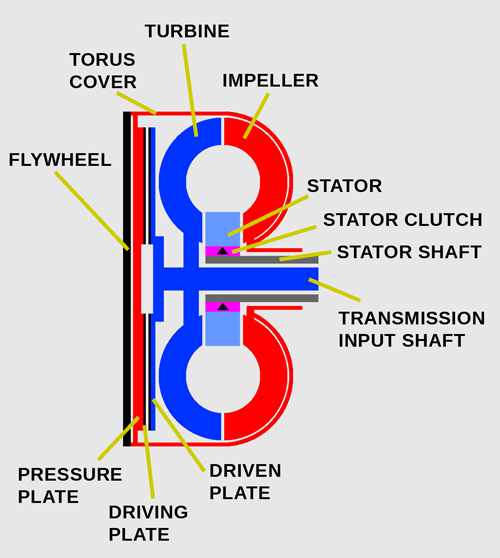 When starting, the fluid clutch’s driving torus (the impeller) may reach a speed of 2,000 rpm or more before the driven torus (the turbine) begins to move at all, a point known as stall. Once the vehicle is moving at a constant speed, the speed difference between the impeller and turbine diminishes, eventually reaching a minimum point known as coupling stage. However, even at coupling stage, the turbine still turns somewhat slower than the impeller. For example, if engine speed is 2,500 rpm, the turbine might only turn 2,375 rpm: hydraulic slippage of 5%. Unlike a reduction gear, this speed reduction doesn’t multiply engine torque. The speed difference between impeller and turbine is simply lost to heat within the operating fluid. At idle and very low road speeds, slippage is desirable because it keeps the engine from stalling or lugging in gear. Hydraulic slippage also offers some advantages during acceleration: As with a plate clutch, a certain amount of slip makes for a much smoother takeoff. Also, as we explained in the sidebar of our article on GM’s other early automatic transmissions, torque converters utilize the speed difference between the driving and driven torus members to multiply engine torque. Hydraulic slippage is much less desirable at cruising speed. First, that slip wastes some fuel — you’re “paying” for more engine revolutions (and more power) than reach the driveshaft. Second, the nonlinear relationship between impeller and turbine speed can be troublesome. Turbine speed tends to fall behind impeller speed any time load increases (for example, when going up a steep grade) and an increase in engine speed doesn’t immediately produce a corresponding increase in turbine speed. Fluid clutches also don’t allow much engine braking. When you coast in gear, the transmission attempts to drive the engine crankshaft, whose inertia causes a braking effect. With a plate clutch, that effect is often quite pronounced, especially in a reduction gear, because of the mechanical connection between the engine flywheel and the transmission input shaft; neither can overrun the other. That isn’t true of a fluid clutch, whose torus members are free to rotate at different speeds. When coasting, the turbine overruns the impeller, which causes slippage, but relatively little braking effect. This is why lifting off the throttle in a car with a fluid coupling or torque converter can feel almost like shifting into neutral. One way to minimize coupling slip is to supplement the fluid clutch with a plate clutch that engages when the vehicle reaches cruising speed. 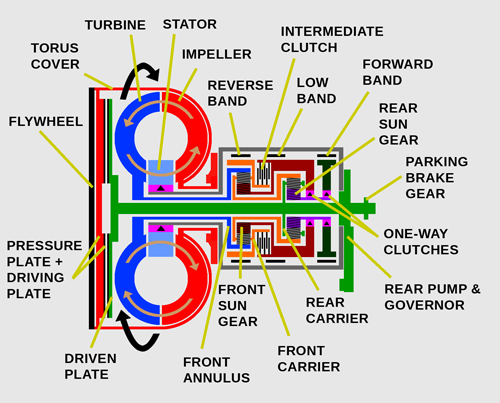 There are several ways to arrange such a clutch, but the common object is to create a mechanical connection between the engine and the transmission input shaft (which otherwise is driven by the fluid clutch’s turbine(s)). When that connection is fully engaged, the fluid clutch’s torus members are effectively locked together — they must turn together at engine speed — and transmit no torque. All engine power flows through the mechanical clutch directly to the input shaft. As long as this mechanical lockup remains fully engaged, there is no slip, which improves fuel economy (typically by around 4% at cruising speeds) and provides throttle response and engine braking comparable to a vehicle with a manual gearbox. However, such a lockup clutch can’t remain locked all the time. For one, the engine would stall every time the vehicle came to a halt with the lockup clutch engaged unless the driver shifted to neutral each time. Also, engaging a lockup clutch will prevent a torque converter from multiplying torque. Therefore, a lockup clutch needs to be accompanied by some mechanism to selectively engage or disengage the clutch. On some prewar bus and rail car transmissions with lockup torque converters, the lockup clutch was engaged manually, but automotive lockup clutches are designed to engage and disengage automatically. The usual strategy is to disengage the clutch at idle (or just off idle) and during acceleration and then then engage the clutch for cruising. Lockup clutches were used in some nonautomotive torque converters before World War II, but the first regular-production automotive application was the 1949 Packard Ultramatic Drive, which established a model for subsequent transmission designs. It was followed in fairly short order by the 1950 Studebaker Automatic Drive, which took a somewhat different approach to the same problem. Ultramatic’s lockup clutch was a hydraulically operated “wet” clutch located within the torque converter housing, between the engine flywheel and the converter turbine. The clutch plate itself, which was faced on both sides with cork, was splined at its hub to the transmission input shaft. The space ahead of the clutch formed a hydraulic cylinder containing an annular steel piston that acted as a pressure plate. 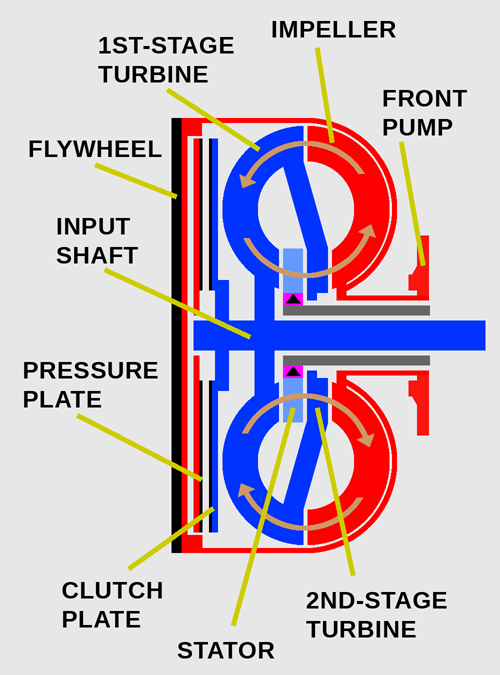 Filling the cylinder with pressurized oil would lock the pressure plate to the clutch plate itself, forcing the clutch and input shaft to rotate with the torus cover at engine speed. If oil pressure to the cylinder was relieved, the pressure plate would no longer be held against the clutch plate, disengaging the clutch and allowing the torque converter to function normally. Like the contemporary Buick Dynaflow, Ultramatic was designed to operate most of the time in its direct drive top gear. Since the transmission was largely dependent on the torque converter for torque multiplication, it was crucial that the lockup clutch not engage prematurely and that there be some means to immediately disengage it for acceleration. Packard achieved that goal by treating the engagement of the lockup clutch like an automatic gear change. A spring-loaded plunger valve controlled oil flow to the lockup clutch’s hydraulic cylinder. The valve was pushed open or closed by opposing pressures generated by a throttle-controlled valve and a centrifugal governor driven by the output shaft. Once governor pressure was sufficient to overcome the combined spring and throttle valve pressure, oil would be applied to the clutch cylinder, engaging the lockup clutch. If governor pressure dropped below that threshold, the clutch would disengage. On early Ultramatic-equipped Packards, the lockup clutch would not engage until road speed reached at least 15 mph (24 km/h) even on a light throttle. Opening the throttle further could delay engagement to a maximum of 56 mph (90 km/h). To avoid stalling or lugging the engine, the clutch would automatically disengage if road speed fell below 13 mph (21 km/h). There was also a “kickdown” mechanism that allowed the driver to disengage the clutch at road speeds between 13 and 56 mph (21 and 90 km/h) by flooring the accelerator, allowing the torque converter to again multiply torque. Unsurprisingly, each engagement or disengagement of the lockup clutch felt like a shift, giving less technically knowledgeable drivers the mistaken impression that Ultramatic was a two-speed automatic. (Until late 1954, the transmission’s planetary gearset always remain in direct drive unless the driver manually selected Low.) With the clutch engaged, Ultramatic also transmitted some drivetrain vibration that the torque converter would otherwise have absorbed. Although this arrangement sacrificed some of the smoothness that was the main rationale for early automotive torque converter transmissions, it made Ultramatic more efficient than the early Dynaflow, at least at cruising speeds. Introduced for the 1950 model year, Studebaker’s Automatic Drive was developed in partnership with Borg-Warner and was more broadly known as the DG series, after the Borg-Warner Detroit Gear Division that did much of the development work. The DG series transmissions were notionally three-speed automatics (although early iterations were designed to start in second gear) with a torque converter lockup clutch. However, that clutch was used in a distinctly different way than was Packard’s. 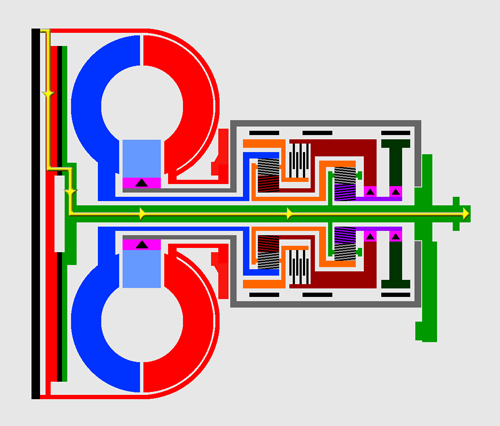 The DG series transmissions obtained their indirect ratios with a compound planetary gearset. In first and second gears, the converter turbine drove the front annulus (ring gear). 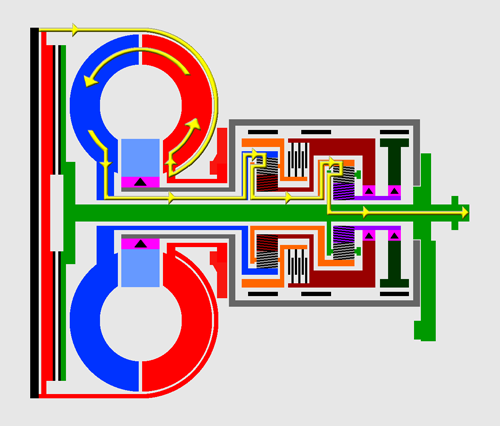 In first, the low band and one-way clutches held both sun gears, causing the ring gears to drive the planet carrier and output shaft at 43.3% of turbine speed (1 / 2.31). In second, the low band was released and the multi-disc clutch engaged, causing both ring gears to rotate at turbine speed. 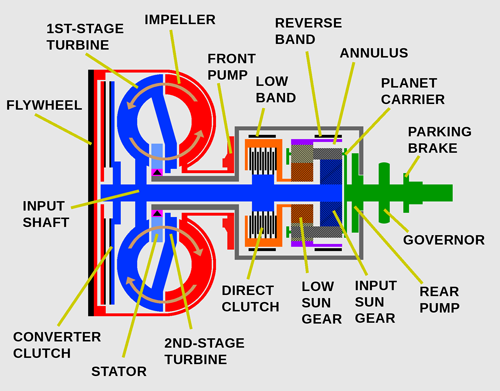 Reaction torque locked the rear sun gear against the rear one-way clutch, driving the planet carrier and output shaft forward at 69.7% (1 / 1.44) of turbine speed. Those gear ratios were in addition to the torque multiplication provided by the torque converter. Shifting to third gear was accomplished by engaging the torque converter lockup clutch. Once engaged, the lockup clutch simply drove the output shaft at engine speed (not turbine speed). This overran the rear unit planet carrier, unlocking the rear sun gear’s one-way clutch and putting the transmission in direct drive. Unlike Ultramatic and many subsequent torque converter automatics, the converter of the DG series was completely inoperative in top gear, so obtaining any additional torque multiplication required a downshift to second gear. Studebaker-Packard (the two companies merged in 1954) dropped both of these transmissions after the 1956 model year. The replacement was a cheaper and somewhat simpler Borg-Warner unit — which Studebaker-Packard called Flightomatic — that deleted the DG’s lockup clutch. Borg-Warner continued to sell the DG series for several more years to some non-U.S. customers, but U.S. automakers would not rediscover the lockup clutch for another 20 years.